The fourth major installment in a series of larg-scale strategy games, which originated in 2002 as a spin-off to the popular Europa Universalis series. Both franchises are consistently developed by Paradox Interactive. 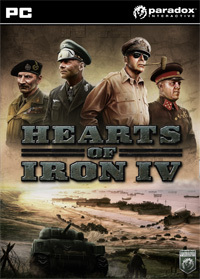 Hearts of Iron IV is the next installment of the popular strategy game series in which the player conducts the politics of one of the countries from the war and interwar period – the timeline of the game is set between 1936 and 1948. It is up to the player to choose the appropriate strategy and foreign policy and to keep up with enemies in the arms race of the 20th century world. The game was made by the Swedish studio Paradox Development, known widely for its complex, historically themed strategy games. The company, with its main office in Stockholm, produced and released such titles as the Europa Universalis series, Crusader Kings – in many ways similar to the previously mentioned titles – and the Hearts of Iron series. The newest installment uses the same engine as Europa Universalis IV and provides a new, refreshed and clearer User Interface. The distinguishing feature of the forth installment in the Hearts of Iron series, just like in the case of the previous releases, is the very accurate recreation of history, together with the full freedom of creating an alternate future. In Hearts of Iron IV players will meet many real historical characters of World War II (Prime Ministers, Army Commanders and other political and military figures); the armies and technologies of each country are also perfectly accurate. You will also come across countless historical events in the form of smaller quests that you can choose by yourself, which can be considered the next steps in the long journey of your country. The completion of said missions will result in quick injections of Diplomatic Power points – another novelty, added in the fourth Hearts of Iron game. A constant backup of points will be necessary, e.g. to influence ministers of the government or to choose further quests in your campaign. Just like in the previous games of the series, the players can control a country actively engaged in the war effort, like France or Great Britain; they can choose to take a back seat as one of the nations whose political situation is not as obvious as a state of open war, e.g. one of the South American countries. The developers of the game put a lot of effort into reducing the need for micromanagement – a major issue in the previous installments of the series – allowing the player to focus more on the overall strategy and worry less about the specific tactics and movements of every individual army or unit. The possibility of converging several provinces into a region was also introduced into the game, making it easier to manage different parts of your country and its newly conquered territories. The addition of seasons and the day and night cycle gives the game a lot of depth, as you need to carefully plan for the ever-changing weather in order to make sure that you will be the one to prevail on the battlefield. Game score 8.085 / 10 calculated out of 892 players' votes. Expectations before the premiere: 9.5 / 10 calculated out of 729 players' votes. After seven long years, Hearts of Iron makes a big comeback. Ladies and gentlemen, the season for sleepless nights full of orders, international schemes, and endless taste of defeat is now officially open!